We like our heroes, don’t we? But mostly we prefer to admire them from afar—so far that we don’t have to see what they actually look like. Francis of Assisi is one of the most beloved saints of the church’s history. Who wouldn’t love a man who called birds and wolves alike “Brother,” who stands there looking charming on your birdbath to remind you that Nature is Cool? It’s easy to forget that Francis also said that if you have two coats, the second is stolen from the one who has none. Today we celebrate the life and sacrifice of Martin Luther King, Jr. He was a man, imperfect and all too mortal, but one who lived his life and gave his life in the service of a cause greater than himself. Now that he’s gotten a postage stamp and a national holiday, we can all get behind this great American who had a dream that blacks and whites would be able to eat in the same room. There aren’t too many whites who are still hanging onto the dream of extreme segregation from blacks, though there are plenty who wouldn’t want their daughter to marry one. But in the process of celebrating this American hero, we’ve remade him in our own image. Maybe a fitting way to celebrate him today is with a small reality check. First, Dr. King did not invent the Civil Rights movement, and he wasn’t its sole leader. He was propelled to the front in large part because he was educated, articulate, charismatic and very self-confident, even fearless. Second, Dr. King did lead a non-violent campaign against segregation, and helped prod the national conscience into reconsidering whether black Americans really needed to be kept quite so firmly “in their place.” His obvious willingness to put his own life on the line gave him the moral authority to tell white America it needed to change. Being a gifted preacher, he knew how to work moral authority once he had it. Why are there millions of poor people in America? And, when you begin to ask that question, you are raising questions about the economic system, about a broader distribution of wealth. And I’m simply saying that more and more, we’ve got to begin to ask questions about the whole society . . . we must come to see that an edifice which produces beggars needs restructuring. To talk like that in the midst of the Cold War was the political equivalent of calling the authorities snakes and vipers, and damning them to hell. King is often portrayed as a moderate in comparison to the more militant Malcolm X. But King’s vision was actually far more radical than that of Malcolm X: radical in the sense of addressing the “roots.” Malcolm called upon black people to assume the power to shape their own destiny. King wanted to redefine power, to see it as the capacity to transcend received tribal loyalties and build a “Beloved Community” in which racism, economic inequality and war are the enemies. These too are our brothers . . . I believe that the Father is deeply concerned especially for his suffering and helpless and outcast children. I come tonight to speak for them. If you substitute ISIS or al Qaeda for the Vietnamese, you’ll see just how radical this message of love actually was. And you begin to understand the inevitability of his death. King was a prophet; he spoke truth to power. But power is not interested in truth; power wants power. 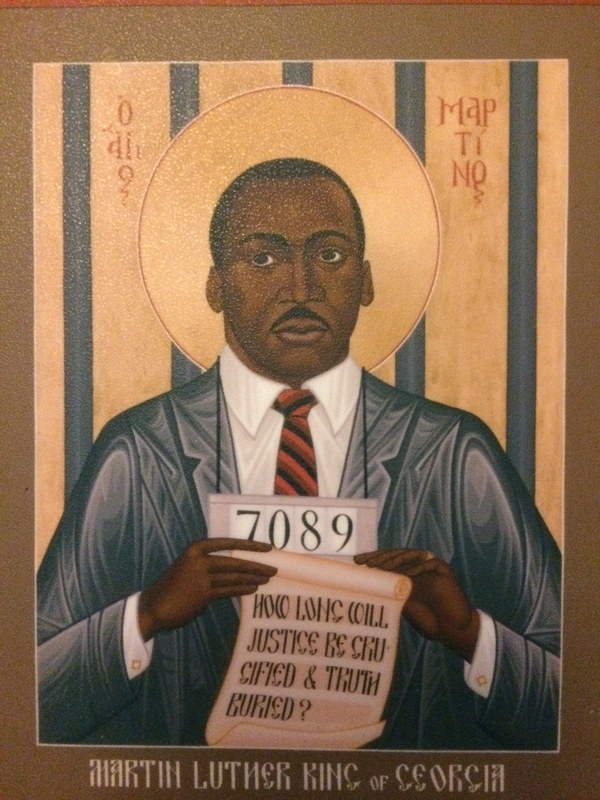 Dr. King said that “the calling to speak is often a vocation to agony,” and he (and his family, it should be noted) paid the ultimate price for believing and proclaiming that every human is made in the image of God and deserves security and dignity and love. Would I risk my life to affirm that? Would you? If that doesn’t seem like something worth dying for, then maybe we need to rethink just what it is we’re celebrating today.